Successfully Added VKWorld Mix Plus Android Phone - Bezel Less Display, Android 7.0, Dual-IMEI, 3GB RAM. Quad-Core, 4G, 5.5-Inch (Black) to your Shopping Cart. The VKWorld Mix Plus is a bezel less smartphone that lets you enjoy an unlimited visual experience at an affordable price. This Cheap Android phone will truly treat you to stunning visuals on its edge-to-edge 5.5-Inch display. By supporting HD resolutions and IPS technology, you can be guaranteed to experience vivid colors and high-details no matter your viewing angle. If you’re a fan of mobile entertainment, the VKWorld Mix Plus Android phone will certainly uplift your user experience. It furthermore runs on Android 7.0, meaning that you can expect a smooth performance no matter what you throw at it. With its Dual-IMEI numbers, this Android smartphone brings along great connectivity. You’ll be able to slide in two SIM cards and stay connected to both at the same time. This provides you with great possibilities to separate work and private life in one smartphone. It furthermore supports 4G. Thanks to this, you can take advantage of the fastest mobile data speeds and browse the web no matter where you’re at. 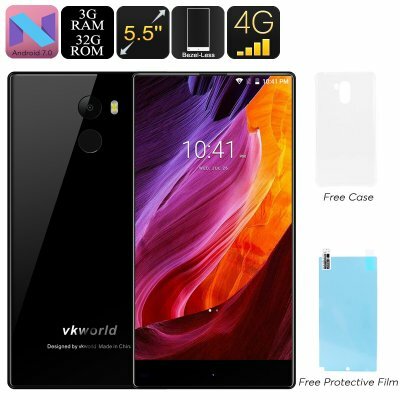 Whether you wish to engage in online calls, browse the web, or download media via Google Play – nothing is impossible with the VKWorld Mix Plus Android phone. thank you very much.....perfect,,,İ WANT BUYİNG NEW PRODUCT FROM CHİNAWİSİON..